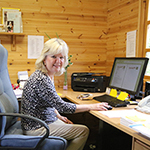 Mrs Julie Casely has worked closely with Mrs Bevan since 2001 and trained alongside her. 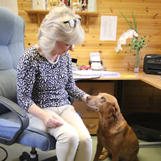 Sharing a passion to improve services for the elderly, she accepted the post of General Manager of Sidmouth Nursing Home in November 2006, when it was purchased by Mrs Bevan. Mrs Casely has a background in Management. She started her career working for The Department of Health and Social Security in 1980 and has held a number of roles in the Civil Service that have involved working closely with the general public. She believes that the provision of excellent Care can only be delivered when a whole team share a common belief that people should be treated with the utmost dignity and respect. Mrs Casely has devoted the last twelve years working hard towards improving elderly care provision. She has a hands on approach and has been responsible for developing and nurturing the caring skills of her exceptional team. Mrs Casely obtained the Registered Managers award in 2008 and has also devoted time to raising funds for the National Society for Prevention of Cruelty to Children. The Manager undertakes constant quality assurance exercises by primarily speaking with our residents who and can state their individual preferences on daily living and have a direct influence over the daily menu. Family members and close friends are also consulted for their valuable views/input. Care plans are reviewed on an ongoing basis and at least once a month. These are done in consultation with the resident and relatives who are given access to the plan at all times. If a resident or relative wishes to make a formal complaint, the complaint is taken seriously and dealt with in accordance with The essential standards. The Management work closely with our residents to ensure that there should be no need to complain as we endeavour to meet all needs. As with any successful organisation, the quality of the team is paramount. All staff, whatever their role are recruited under our ethos. They must demonstrate kindness, compassion and professionalism at all times. Our Registered Manager, Mrs Sherin John, is testimony to this and we are truly fortunate to have her. Sherin qualified as a Registered General Nurse in 2007 and has dedicated herself throughout this time to the physical and emotional well being of our residents. She is also a qualified Nurse Mentor. Sherin has played a pivotal role in the success of our Home over the last 10 years and helped to establish it as a centre of excellence in care. Sherin heads up a team of talented Nurses. She is supported by our Deputy Manager Mr Vinu Chandran and our Clinical Lead, Mrs Anitha Kuttappan. Vinu and Anitha hold the RGN and Nurse Mentorship qualifications. They are highly skilled,dedicated nurses who have worked tirelessly and with significant commitment over the years to ensure a continual delivery of excellent care. We are very proud of our Team. They include three other superb nurses, Nurse Assist and Nurse Support roles and a number of excellent carers and domestics who perform to high standards. We have nothing but praise for our chef who delivers nutritious and delicious food every day. Our staff turnover is very low. 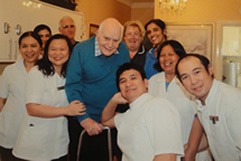 This has ensured a continuity of care by a familiar team who provide a personal touch. Well known to residents, families and the wider community in Sidmouth, we pride ourselves on our family ethos and all pull together to achieve our goal. Mrs Casely receives constant feedback about her team. She sys that they are quite simply, 'outstanding'.